On a chilly but sunny Saturday the Harriers fielded 8 teams across the age categories. After a quick recce run the experienced M65 guys deemed that the flat course was surprisingly dry and should spark some quick leg times on the 3km loop. First off were the ladies and the mens 65+ teams. The 65+ men got the day off to a great start with a ding dong battle with their usual adversaries from Blackheath & Bromley, with the black vests clinching the silver medal with a great final leg from Bob Tintinger in 12:29mins, 3rd fastest M65 of the day. 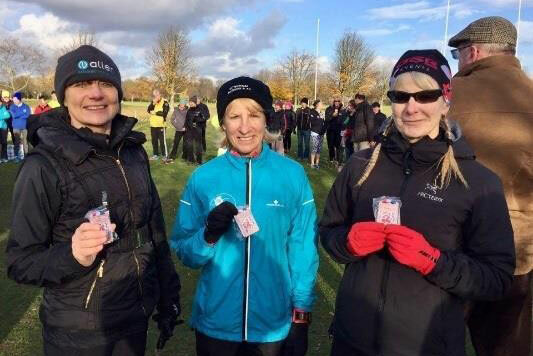 All the Harrier ladies W45 and W55 teams had fantastic runs and the 55+ ladies 'A' team of Paula Fisher, Janice McWilliam and Sharon Burton had a stormer and clinched 3rd place and the bronze medal. Awesome ladies ! The final race of the day included the mens 35+, 45+ and 55+ teams. The Harriers M35+ 'A' team had a great run from start to finish in a nail biting race, first leg was taken out by the experienced Richard Harris in a magic 9:56 then the Harriers took the lead on the 2nd leg with a majestic run by Gareth Sampson of 9:51. All the boys put in a great shift to take the national bronze medal, well done fellas, super proud !